JERUSALEM – Archaeologists working in Israel have announced the discovery of an ancient artifact in Israel that confirms a biblical account in the book of Joshua. The Associates for Biblical Research (ABR) is a ministry committed to exploring the ancient biblical world through archaeology. According to ABR’s website, archeological findings frequently provide direct support for Scriptural accounts. In late May of last year, an ABR team spent two-and-a-half weeks excavating ruins at Israel’s Khirbet el-Maqatir site, which is nine miles north of Jerusalem. ABR experts believe the site is the location of Ai, which, according to Joshua 7–8, was a city the Israelites conquered and destroyed during their conquest of the Promised Land. ABR’s excavation last year proved to be very fruitful, as the team discovered an underground cavern, ruins from an ancient gate, and over 100 coins. Then, as explained in an online report published by ABR, the archaeological team discovered an object of exceptional importance on the last day of their excavation. The ABR report explains that a scarab is “carved in the shape of a beetle, with a rounded back and a flat underside.” The scarab discovered by the ABR team features a hole drilled longitudinally through it—evidence that it was most likely worn as a necklace or attached to a ring. Following the discovery of the scarab, an Israeli specialist dated the object to around 1550–1450 B.C., which was the Late Bronze I period. Henry Smith Jr., Director of Development for ABR, told Christian News Network that the assigned date for the scarab aligns well with other evidence and the biblical timeframe. ABR experts say the scarab may have been used by the last king of Ai, before the Israelites defeated the city. According to Joshua 8, the Israelites defeated the inhabitants of Ai and then burned down the city. Overall, the scarab and other artifacts discovered at the site “provide solid evidence for dating our fortress to the Late Bronze I period, the time of the Exodus and Conquest,” ABR reports. Due to the archeological and biblical significance of the scarab, Christianity Today named it the #1 biblical archeology discovery of 2013. 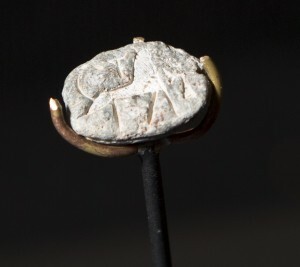 Smith told Christian News Network that the scarab, along with other artifacts from the Khirbet el-Maqatir site, were put on display at Houston Baptist University last week and will remain available for public viewing until December 20, 2014. Smith also said a symposium on February 8th will feature speakers highlighting the importance of the Bible’s archeological historicity. In a blog post, Bryant Wood with ABR said that this is an exciting time for biblical archaeology.